The weather in the Cayman Islands is quite similar to the weather throughout the Caribbean. The islands – Grand Cayman, Cayman Brac and Little Cayman – are located in the western Caribbean. The Cayman Islands are northwest of Jamaica, east of Mexico, just south of Cuba and roughly 640km (400 miles) south of Miami. The three Cayman Islands are coral islands and although Grand Cayman is roughly 130km (80 miles) west of Cayman Brac and Little Cayman, all the Cayman Islands experience similar weather conditions and climate patterns. The climate of the Cayman Islands is a tropical marine climate. The dry season lasts from November to April, while summer is the wet season and lasts from May to October. Hurricane season occurs from July through to November. Average temperatures in summer in the Cayman Islands range from 24 to 32 degrees Celsius (75 to 90 degrees Fahrenheit). 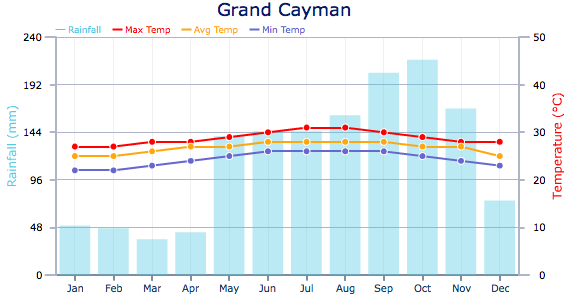 Winter temperatures in the Cayman Islands are only slightly lower than summertime temperatures. The average temperatures in winter in the Cayman Islands are 22 to 30 degrees Celsius (72 to 86 degrees Fahrenheit). Humidity levels tend to be constant throughout the year, with the highest humidity levels experienced during the hurricane season months of August, September, October and November. Humidity levels tend to drop in the evenings as the trade winds have a cooling influence on the island’s tropical weather. The wet season in the Cayman Islands runs from the end of May to October and sometimes into the beginning of November. The wettest months are June, August, September and October – they generally coincide with the Atlantic hurricane season. Rainfall during the wet season is short and sweet – the quick downpours are refreshing and generally don’t disrupt holiday activities. Although the Cayman Islands have over 300 days of sunshine per year, they also lie in the direct path of most of the major storm systems and hurricanes passing through the Caribbean. Therefore, the tropical weather in the Cayman Islands is best enjoyed outside of hurricane season. When is the best time to go to the Cayman Islands? The Cayman Islands tend to experience great tropical weather throughout the year. However, the Cayman Islands are a most popular destination during the winter months of November, December, January, February, March and April. Holidaymakers looking for holiday deals for the Cayman Islands should try to book cheap flights during the summer months from May to October, particularly the months just before peak months of hurricane season, which generally last from August to September. The wet season in the Cayman Islands is the best time to book cheap holiday deals and enjoy less crowded beaches. Most visitors spend the majority of their time here in T-shirts, tank tops, shorts and sandals; and don't forget to bring changes of swimwear, sunhats, sunglasses and plenty of sunscreen. Bring a long pair of trousers (preferably zip offs) for a rainy day, as well as a light raincoat. However, remember that the islanders are conservative and it's common to wear smart casual clothing outside of the main resorts, especially at one of a number of elegant restaurants on the islands, or when visiting a church where visitors are expected to cover-up. Note: January is peak holiday season in the Cayman Islands. North Americans use their winter vacation period to migrate south to the warm waters of the Caribbean for a tropical holiday in the sun. Accommodation prices and flights are at their most expensive during this period. Events: February in the Cayman Islands is Mardi Gras time. The main festival takes place annually on Ash Wednesday at Kaibo Beach on Grand Cayman Island. Both Little Cayman and Cayman Brac host smaller Mardi Gras festivals during February. Note: Although smaller events abound during March in the Cayman Islands, the beaches are the major attractions. Tourists looking for parties should rather plan a trip to the Cayman Islands during December and January. Note: April is the final month of peak season in the Cayman Islands. Last minute holiday deals can be found and it is a great time to book a flight to this Caribbean holiday destination as the season draws to a close and the beaches become less crowded. Events: The Cayman Carnival Batabano is an event in May in the Cayman Islands that it not to be missed. It is an annual event on Grand Cayman during the first week of May. The festival originated through the Cayman’s turtling heritage, but today it is a celebration of dance, music and culture. Events: The Queen’s Birthday is a day when the Cayman Islanders remember their British heritage. The capital, George Town, is host to a grand parade, while the smaller islands and beaches such as 9 Mile Beach, are also host to numerous festivities in honour of the Queen’s birthday. The Flowers Sea Swim also takes place during June. It is an annual one-mile sea swim from Gran Caymans famous Seven Mile Beach. Note: The summer months in the Cayman Islands, particularly the months preceding the hurricane season, are the best time to go diving in the Cayman Islands. The waters are warm and calm and visibility levels are at their best. Note: August marks the start of hurricane season across the Caribbean. The Cayman Islands lie directly in the path of most tropical storms that cross the Caribbean Sea. Note: September is peak hurricane season in the Cayman Islands and although the islands have excellent storm warning systems, September is one of the least favourable months to travel to the Cayman Islands. Note: October sees the end of hurricane season and marks the beginning of peak holiday season in the Cayman Islands. It is still possible to book cheap holiday deals in the Cayman Islands during October as the tail end of the storms systems taper out and the holiday festivities begin. Events: Pirates Week is known throughout the Cayman Islands as the Cayman’s National Festival. This ten-day festival celebrates all things pirate, with fireworks, parades, competitions, street dances and even a pirate invasion! Events: Note only is December peak holiday period in the Cayman Islands, but it is also the month of Christmas, New Year festivities and the Cayman JazzFest. George Town plays host to this event that has seen acts such as Alicia Keys. The Cayman Islands Marathon also takes place in December each year.